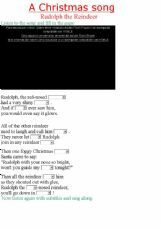 A very simple activity to enjoy and sing a typical Christmas carol . Merry Christmas! 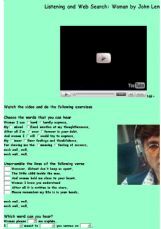 Lennon�s beautiful song is an ever-green which can be understood quite easily. Additional web-search to get student know a bit about John and Ono�s ever-lasting love. My son Zoli suggested that I should make an exercise on Mad World for developing listening skills. 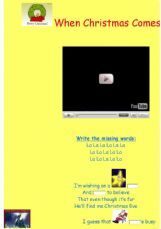 I have added a web quest about the origin of the song, too. Easy to learn. A great song to develop listening skills. Easy to learn. This is one of my favourite songs. My students have always liked, that�s why I�ve done it. I also have a printable to work with students in the classroom. I hope you like it.